Like scoring a big promotion or a date with your longtime crush, a luminous, white smile is the stuff that dreams are made of. And it’s no wonder, considering how much the appearance of our teeth affects our image. Case in point: Research shows people with whiter teeth are perceived as more socially competent, smarter, more satisfied with their relationships, and more psychologically adjusted . Another study (full disclosure: It was commissioned by Crest Whitestrips) suggests that a brighter smile may lead to more success in both your professional and personal lives. Needless to say, most people seem to be curious to find which foods and drinks lead to a more radiant smile—and which ones tint and tarnish our pearly whites. 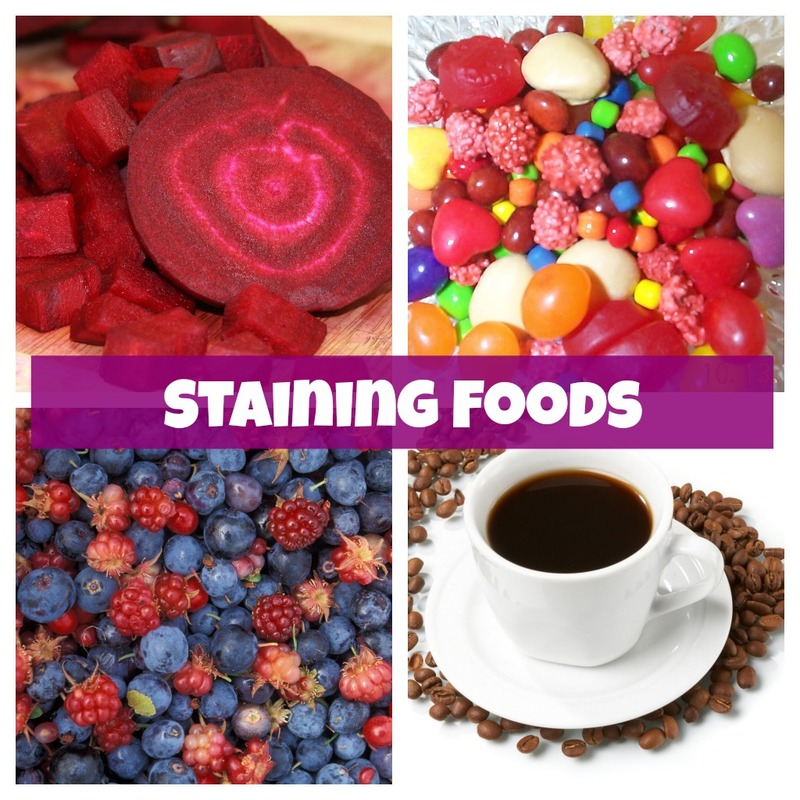 If you’re seeing tons of stains, try to cut your intake of the foods on the “naughty” list below to every other day max, says Sally Cram, a periodontist in private practice in Washington, D.C., and spokesperson for the American Dental Association. And most importantly, stay on top of your regular dental habits, like flossing daily, brushing twice a day, and popping into your dentist’s office for regular check-ups. Read on for the foods that dull your smile and which ones will make it sparkle. If you notice a yellowish tinge to your teeth, acidic foods (think citrus fruits and tomatoes) might be to blame. Even though they’re nutrient-packed, these colorful eats can erode the enamel, which might expose the yellow-hued dentin—a.k.a. the tissue beneath the enamel made up of mostly calcium and phosphate crystals, Cram says. Sorry, java junkies: Your favorite cure for tired mornings contains tannins (acidic polyphenols) that lead to staining and discoloration, Cram says. Plus, because it’s acidic, it alters the pH balance of the mouth, making any acidic foods you eat afterward damage the teeth much more quickly, explains Kourosh Maddahi, a cosmetic dentist based in Beverly Hills. His solution: Drink your coffee with a to-go lid—not using a straw. Doing so will cut back on the acidic-environment situation that coffee causes in the mouth and also prevents the fine lines that form when you pucker your lips to sip from a straw, Maddahi says. That whole sugar-will-rot-your-teeth-out thing? It’s a bit dramatic but kind of hinged on fact. The sugars in delicious treats like cookies and hard candy (and even snack foods like chips) latch onto your teeth and become the main meal for the bacteria in your mouth. When the bacteria feed off these sugars, they release acids that lead to tooth decay, which may be dark and cause back holes in your poor teeth, Cram says. Sugar-laden beverages act the same as sugar-laden snacks, giving the bacteria in your mouth plenty to feed off of (and thus releasing damaging acids), Cram says. Sodas are especially dangerous, since anything carbonated is also acidic and will create holes in the teeth—and this includes sugar-free versions too, Maddahi says . Just like coffee, tea also contains the staining saboteurs known as tannins, so sipping on a cup of chamomile may lead to stains, Cram says. But there’s even more to it than that—like the hue it turns your teeth, for instance. “Green tea stains teeth gray, and black tea stains them yellow,” Maddahi explains. If green tea’s your go-to, he suggests investing in a high quality option—the lower the quality, the worse the stain it’ll cause. And if you just can’t bid the brew adieu, use Maddahi’s to-go lid trick like you would if you were drinking coffee. Also consider adding a dash of milk to your cup. Research suggests that adding milk to your tea slashes its ability to stain your teeth . Wine may be responsible for teeth that’ve turned shades of gray—which, unluckily, is a harder hue to remove than yellowish stains, Maddahi says. The culprits? The same pesky tannins that we see in tea and coffee. But there’s a silver lining: While your favorite malbec may not help your pearly whites stay that way, recent research suggests that it may actually help fight cavities. So go on and pour it up, pour it up—in moderation, of course. Cue the sad violin. As it turns out, sipping on sauvignon blanc can also steal some of the white away from your smile. One study suggests that the lighter type of vino may make tooth stains darker. So while it doesn’t actually cause the stains, its acid content creates little pockets on the surface of the tooth that allow other beverages to seep in deeper, the study’s researchers explain. High-fiber fruits, like pears and apples, may help whiten your teeth, Maddahi says. Not only do they boost saliva flow (which helps keep teeth clean), but their fiber content removes some stains by scrubbing the surface of the teeth, he explains. Just be sure you brush your teeth after having your apple a day—fruit still contains sugars, and you don’t want that sticking around longer than it has to. Scrubbing with the white powdery stuff will whiten teeth naturally, Maddahi says. Simply wet your toothbrush and dip into the powder. One caveat: Don’t make it an everyday habit. Since the abrasive properties of baking soda may cause damage to the enamel of your teeth, he recommends using this method once a week. Strawberry fields forever may be the way to go if you’re looking for a natural way to whiten your smile. The red berries contain malic acid, which may be responsible for this effect, Maddahi says. You can even double up and mash them with baking soda for DIY whitening solution. However, science says that while it does seem to make your teeth look whiter (since you’re removing some of the plaque), it doesn’t penetrate the enamel to provide real, long-lasting results . Good news, cheesemongers: You may be fighting cavities with every delicious bite. Research suggests that eating the savory stuff may lead to a higher pH level in the mouth, which slashes the risk for cavities . Water does more than just keep you hydrated. Research suggests that drinking plenty of H20 keeps the teeth and gums healthy, and fluoridated water in particular helps battle tooth decay. And if you can’t brush after a meal, simply swish around some water to clear sugars and acids. Nuts boast a slew of health benefits, from boosting weight loss to fighting aging and more. And now we can add one more to the list: strengthening our teeth. Because of their protein content, nuts protect our teeth and keep them strong, Cram says. Plus, the chewing it takes to eat each one helps stimulate saliva production, so they also help clean the mouth, she adds. On the flipside, some research suggests that nuts may cause tooth decay and could have been to blame for dental disease in our hunter-gatherer ancestors, so check with your dentist to see what he or she recommends before going too, well, nuts.